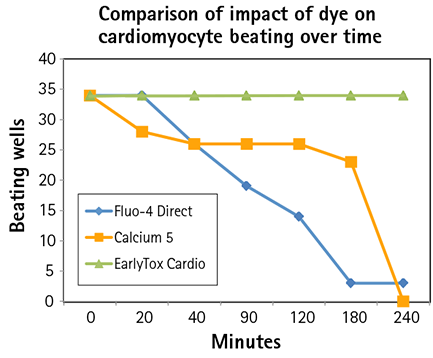 For researchers looking to identify cardiotoxic compounds, the EarlyTox™ Cardiotoxicity Kit allows you to screen more compounds earlier in drug discovery. Now you can prioritize leads and direct medicinal chemistry efforts sooner, improving productivity and reducing costs associated with extensive safety testing downstream. Figure 1: (A) Calcium signal change in untreated iPSC cardiomyocytes incubated for two hours with EarlyTox Cardiotoxicity Dye indicated by calcium peaks. (B) Propranolol slows peak frequency of calcium in iPSC cells. 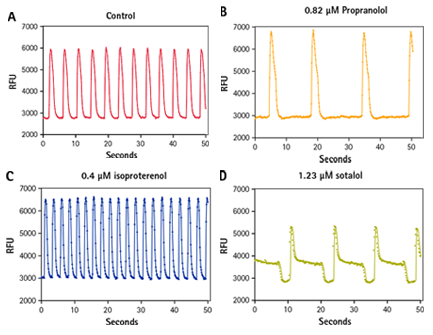 (C) Isoproterenol increases calcium peak frequency in iPSC cardiomyocytes. (D) Sotalol slows peak frequency of calcium in iPSC cardiomyocytes and alters the normal pattern. Figure 2: Beat frequencies were recorded during a four hour period. EarlyTox Cardiotoxicity Dye had the highest beat frequency in all wells. Figure 3: Over time, EarlyTox Cardiotoxicity Dye had the highest average peak amplitude. Signal from the other dyes decreased over time. Figure 4: Thirty-four control wells were compared with each dye over a four hour period. All of the EarlyTox Cardiotoxicity Dye wells remained beating up to four hours. Silenced wells occurred much earlier in the Fluo-4 Direct wells and the FLIPR Calcium 5 Kit wells and were nearly all gone by four hours. 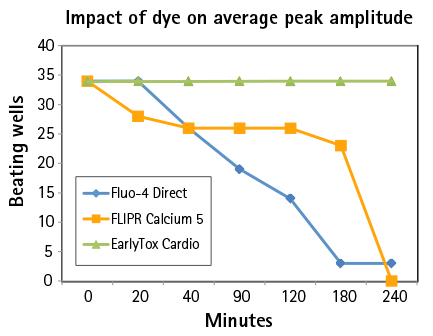 Figure 1: EarlyTox Cardiotoxicity Kits utilize a calcium sensitive dye that is absorbed into the cell’s cytoplasm during incubation. When dye binds with calcium ions in the cell cytoplasm, fluorescent intensity increases, enabling measurement of any changes in calcium concentration. The masking technology does not enter the cell, but reduces extracellular background fluorescence. This helps improve the assay signal window, providing more detail to the beat patterns. 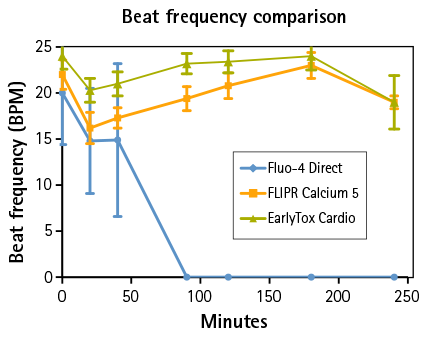 Figure 2: EarlyTox Cardiotoxicity Kit can be used for characterizing the impact of pharmacological compounds on peak frequency (BPM), peak amplitude and beat pattern and is designed to work with stem cell-derived cardiomyocytes or primary cardiomyocytes. Peak frequencies are determined from changes in intracellular calcium concentration monitored by the EarlyTox Cardiotoxicity Dye. Role of calcium in cardiomyocyte contraction-relaxation includes: 2.1. Membrane depolarization occurs, calcium channels open and calcium enters cytosol. 2.2. 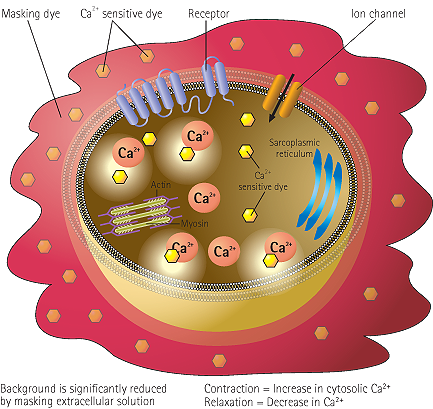 Intracellular calcium triggers calcium release from sarcoplasmic reticulum. 2.3. 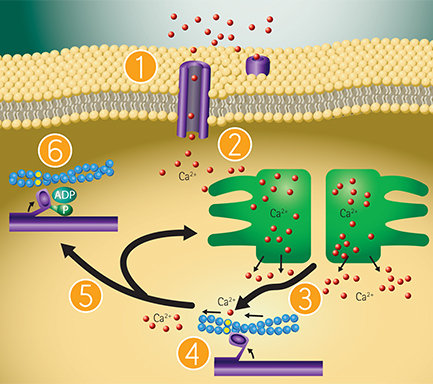 Cytoplasmic calcium binds to troponin, activates sarcomere. 2.4. Cardiomyocyte contraction occurs. 2.5. Removal of calcium by active transport into the sarcoplasmic reticulum and calcium exchange with extracellular fluid. 2.6. Cycle repeats. Bers, D. M. Cardiac excitation-contraction coupling. Nature 415, 198-205 (2002). Braunwald, Eugene. Heart Failure, JACC 1:1, 1-20 (2013). Bolton, T. Calcium events in smooth muscles and their interstitial cells; physiological roles of sparks. J Physiol 570:1, 5-11 (2006). Gheorghiade, M. et. al. Combining SERCA2a Activation and Na-K ATPase Inhibition: A Promising New Approach to Managing Acute Heart Failure Syndromes with Low Cardiac Output. Discovery Medicine 063, (2011). Knollmann, B. & Roden, D. A genetic framework for improving arrhythmia therapy. Nature 451, 929-936 (2008).